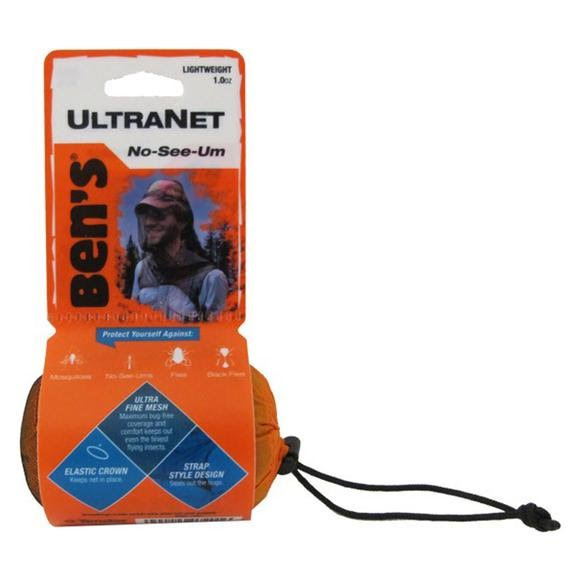 When the mosquitoes, no-see-ums, and other insects are attacking, Ben's fine-weave UltraNet by Adventure Medical Kits will keep even the tiniest of pests out! Ben's UltraNet provides the highest visibility of any competing no-see-um net on the market. When the mosquitoes, no-see-ums, and other insects are attacking, Ben&apos;s fine-weave UltraNet by Adventure Medical Kits will keep even the tiniest of pests out! Ben&apos;s UltraNet provides the highest visibility of any competing no-see-um net on the market. And Ben&apos;s ingenious UltraNet design seals out the bugs around your chest while allowing you to keep your shirt zipped down and open for maximum ventilation. Provides maximum coverage for maximum ventilation. Eliminates uncomfortable neck elastic that often exposes skin to bugs. 15 Denier fiber knit, 21gsm with no-see-um pore shape size of 0.5mm is impenetrable! Elasticized crown keeps net in place on head or hat no matter your movement or wind speed.